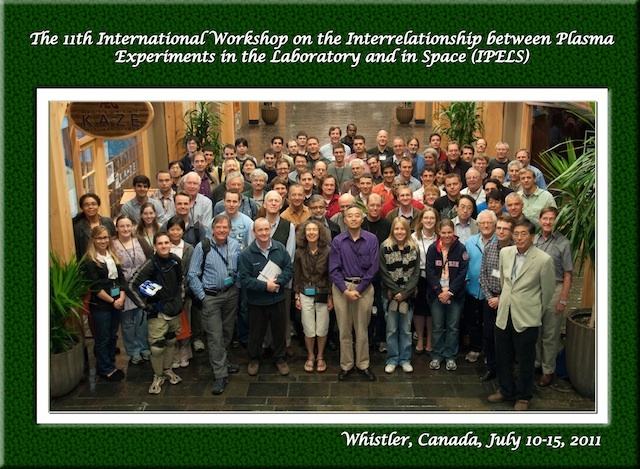 Award Announcement and Special Acknowledgements of 11th International Workshop on the Interrelationship between Plasma Experiments in the Laboratory and in Space (IPELS). We are delighted to announce that the best student paper for the 2011 IPELS meeting has been decided, we have selected Ms. Auna Moser from Caltech. Her presentation was titled “Experimental Observation of Instability Cascade from MHD to Ion Skin Depth Scale Resulting in Magnetic Reconnection”. The 2011 IPELS meeting was successfully held from the evening of July 10 to the end of July 15, 2011 at The Westin Resort & Spa in Whistler, British Columbia, Canada. As a 20-year old tradition, we aim to bring together active members of the laboratory, space and astrophysics plasma physics communities from around the world, and to foster intellectual interaction and scientific collaboration addressing the processes responsible for various common plasma phenomena. We sincerely thank all attendees for their efforts to come bringing exciting scientific results to make this meeting successful. We thank the Scientific Organizing Committee and the International Steering Committee for their guidance, advice, and hard work for the excellent scientific programs. We also thank the conference coordinator, Ms. Carol Austin, for her tireless efforts to make this meeting as perfect as possible. Special thanks also go to the onsite conference assistance by Ms. Kathleen Lukazik, the chief negotiator of the conference contract by Ms. Lynda Lauria, website support by Mr. Kenny Silber, budgetary assistance by Ms. Olga Tishinin and Ms. Jackie Pursell of PPPL, and Ms. Susan Duncan of Princeton University’s Astrophysical Sciences. Lastly, we thank the PPPL management for their support especially during the contracting process. This meeting is supported by U.S. DOE Office of Fusion Energy Sciences, NSF Physics and Astronomy Divisions, and NASA Heliophysics Division, and also in part by the JSPS Core-to-Core Program on CMSO. The 12th IPELS meeting will be held in Japan by Prof. Yasushi Ono from University of Tokyo. See you in 2013 in Japan.